Our Trackabout – FOR SALE! 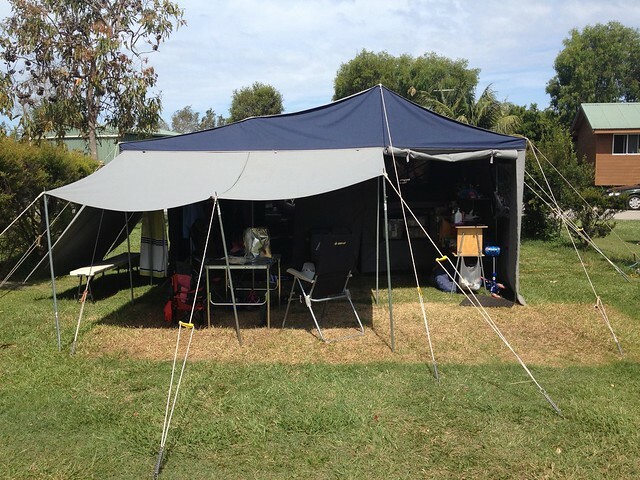 Nearly 5 years ago we took the plunge to purchase our first camper trailer. We have loved every moment in our trusty Trackabout, but the time has come for us to look at upgrading. First, we need to sell the Tracky. We’d recommend this to anyone who wants to get out more and see the country. It has been a great first camper for us, and we’re sure it will be for the next owner! This whole package needs nothing – ready to go and see the country! There are pics below, and of course, all through our blog! $11500 negotiable. Happy to assist with delivery where possible. 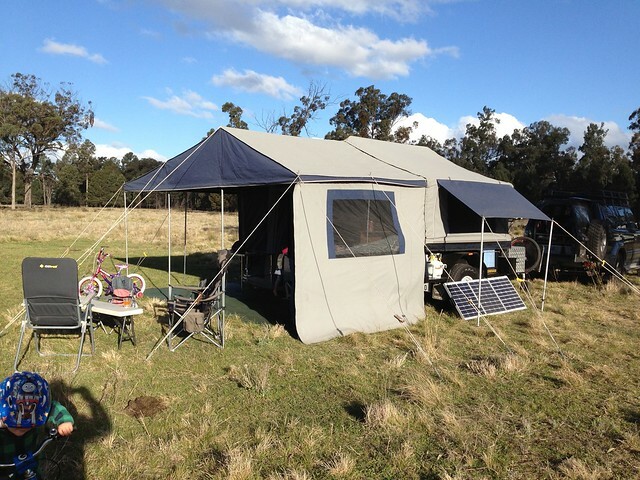 5 years ago our family upgraded from tent camping into this awesome camper trailer. 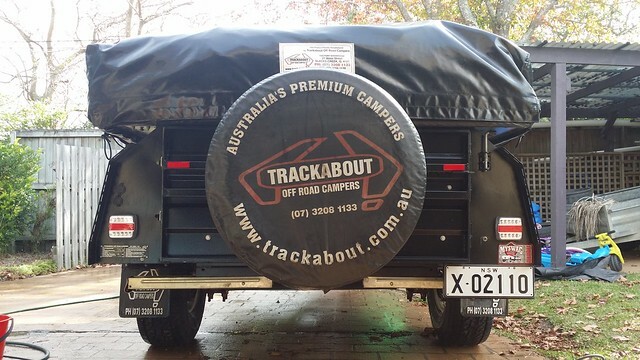 We researched thoroughly and decided that, for the price, nothing could compare with the Trackabout. The quality of trailer, canvas, and everything else, was as good as we could get at the price. On top of all that, it was Australian made and supported. 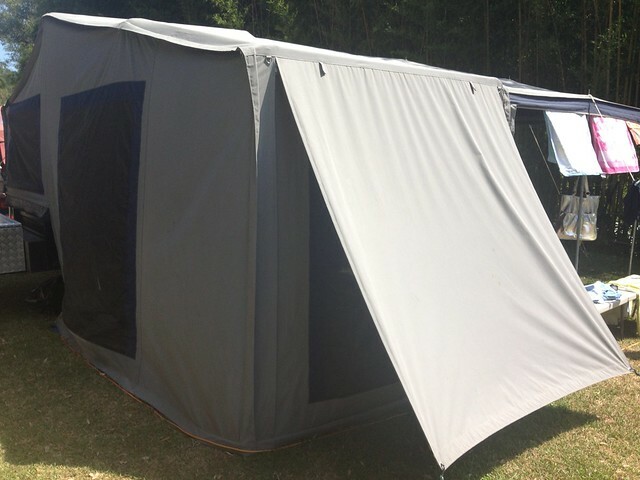 Canvas – Full annexe including all walls to completely enclose the annexe space. There are also flymesh walls to keep out those pesky biters. We normally set up with just the kitchen end wall to provide a little protection over the kitchen should it rain overnight. 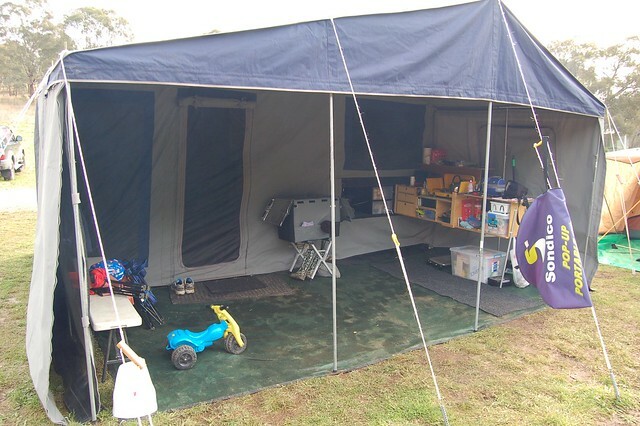 A draught skirt under the trailer bed completely stops any unwanted breeze. 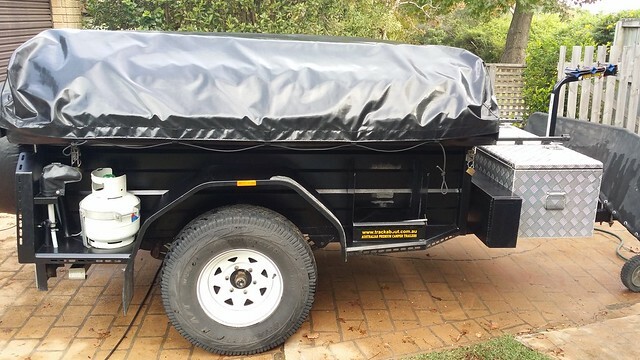 The tonneau cover is extended to allow storage of bedding and other items above the bed, and on top of the packed up camper. 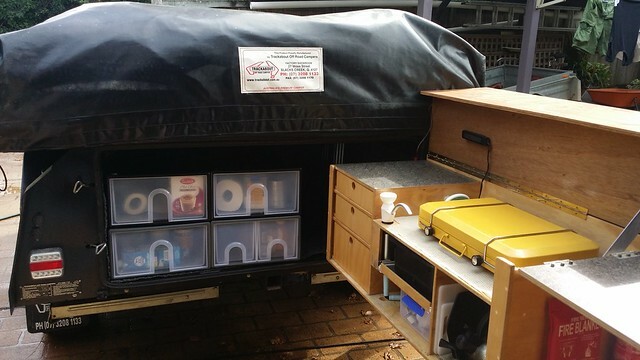 Kitchen – Standard Drifta DSO kitchen attached to tailgate. Includes tub for the sink and hand pump to provide water from the 85 litre tank. I’ve also modified the kitchen to add an extra shelf above the main kitchen area. Under this shelf is an LED light to provide some lighting over the cooking area. 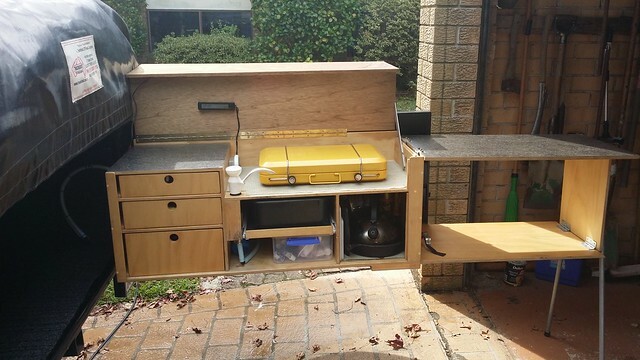 This shelf has been one of our best improvements to the camper, and provides a heap more usable shelf space. Included is our stove which fits the space beautifully, and a 4.5kg gas bottle. There’s also a combination clock / indoor / outdoor thermometer / volt meter that mounts via velcro to the kitchen back. Hitch – OzHitch – really easy to hook up, with great articulation. Tool Box – Large lockable tool box on the draw bar. This houses the single 120Ah AGM battery, and anything else you please. Big enough to fit in a range of tools, porta potty, some firewood, etc. There’s also LED lighting inside the tool box, as well as a single 12 cig outlet which we’ve used to plug in a 12v shower. 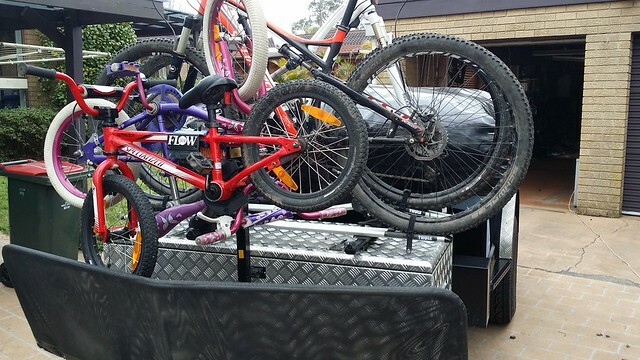 The lid of the tool box has some roof racks, which can be used to attach a range of accessories from a small roof cage to a couple of roof rack mounted bike racks. 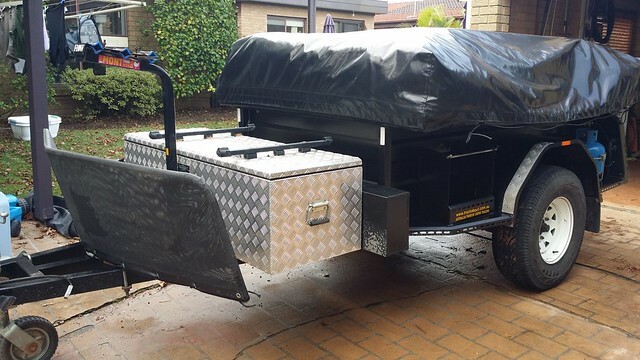 This is what we’ve done, which provides the bikes plenty of protection via the stone guard, and also they are below the height of a full size 4WD tow vehicle. Bike rack – Bike rack to carry 3 extra bikes, also protected by the stone guard. 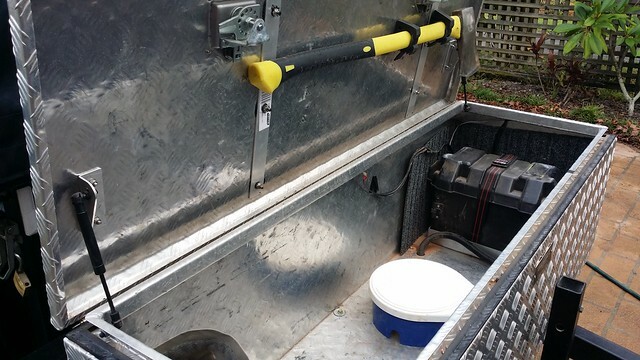 Pole Storage – lockable pole storage box between the tool box and trailer tub to hold all poles, and also the winder for stabilizer legs. 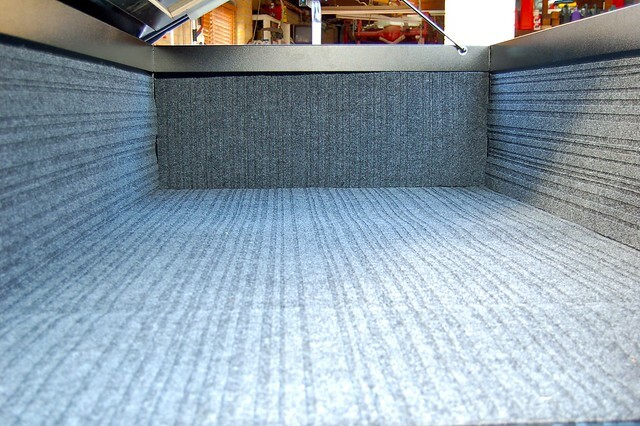 Trailer tub – completely covered internally with marine carpet to protect from scratches. Water – Standard 85 litre tank with hand pumps in the kitchen, and also one on the side of the trailer to wash hands after pack up. I’ve added a tank level indicator to keep an eye on water levels. Internals – Standard trackabout canvas with internal zips for the windows. 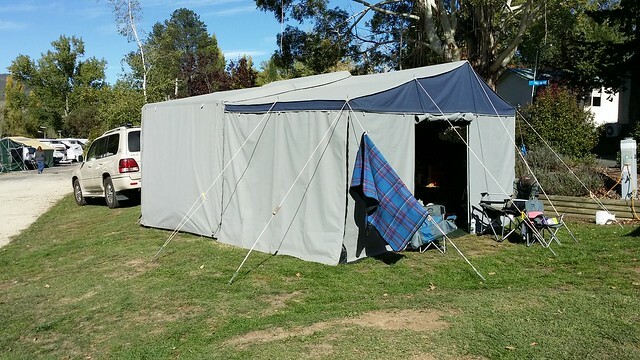 Full switched LED lighting including lights on the main tent bow, reading lights above the bed, and individual lights on either side of the tent. There’s plenty of light inside! There’s also a 12v cig outlet on the switch box for device charging. 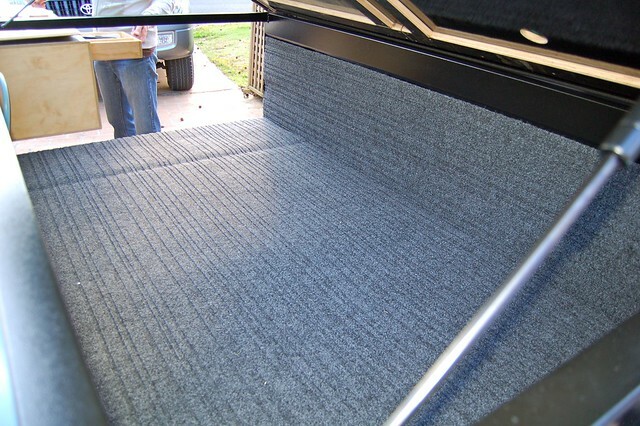 We’ll also include our rubber backed marine carpet for the floor of the camper which adds a touch of luxury to the whole experience! More lighting – Under the annexe I’ve added some more LEDs. The pole over the kitchen, under the kitchen shelf, and also another pole that can be placed wherever you like all have LEDs. They are controlled from switchable 12v cig plugs into a 4 way adapter that plugs into one of the 2 12v cig points on the rear of the trailer. 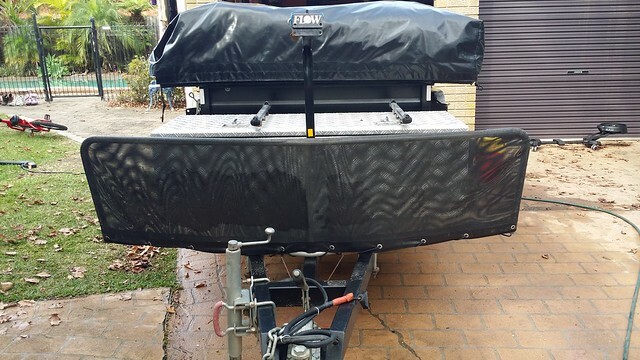 Tail lights – upgraded from standard to marine LED. Springs – 7 leaf eye to eye will handle anything that can be dished out. Electronics – As it came from Trackabout – Anderson plug to charge the 120Ah battery and 4 cig points as described above. 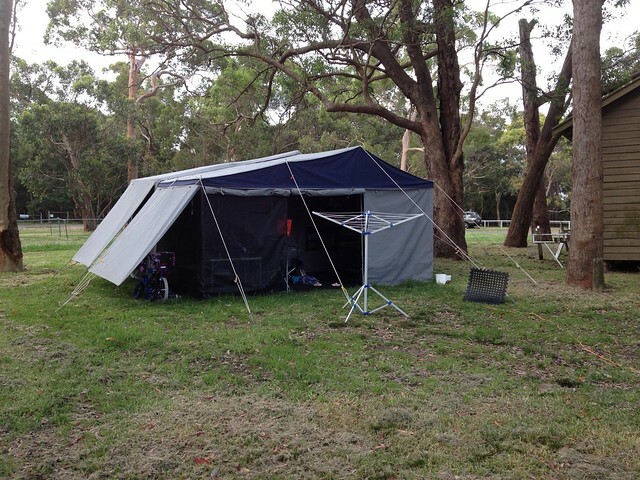 Wear and Tear – This is a 5 year old, well used (and loved) trailer. There has been one tear in the canvas when trying to set up in a strong wind. The tear is above the door and is about 4 cm long. It has been repaired with a canvas glue, and a sail patch on either side. The repair is completely water proof. There are also some stone chips on the drawbar and forward edges of the pole box on either side from our recent trip to the darling river. I’m looking at touching this up, and possibly adding some checker plate, but want to be up front with any potential buyer. Other info – Near new high density foam mattress, been slept on maybe 12 times. We’ll also throw in our pantry drawers that sit in the rear of the camper that give some great space for food. Check out our blog (linked in my sig) to see a whole heap more pics, and to see where we’ve taken her.